Speaking of a more secure grip, the Shuffle was one of the first knives to feature the K-Texture handle, which is made of glass-filled nylon with a repeating pattern of the Kershaw “k” logo. Kershaw could have called it a day at that point but decided to put in a bottle opener with a protruding portion of the backspacer. There’s also a flathead screwdriver that doubles as a lanyard attachment. A deep carry pocket clip also makes carrying this knife no issue. It’s hard to beat this little folder in value and functionality. It’s no surprise the Shuffle has been a perennial favorite among Kershaw’s knives since it was introduced in 2013. It also comes in various colors and blade shapes, including Lime Green. 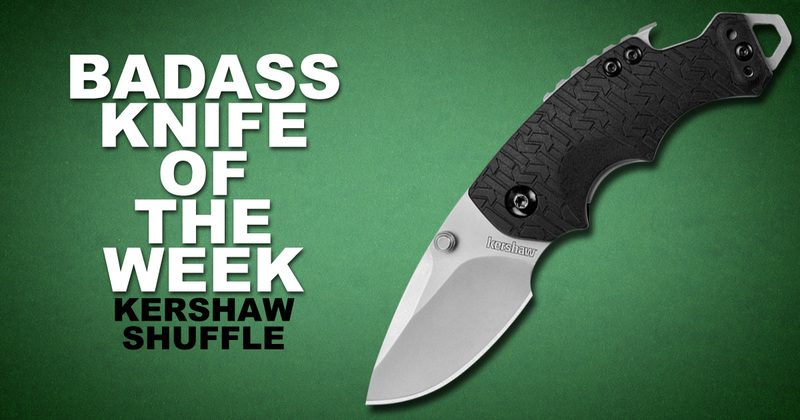 For more info on this Badass Knife of the Week, see the product page for the Kershaw Shuffle. Kershaw Shuffle – Badass knife sound like great knife please share it.